Hello, again! "Weekly Concerns" is a post-a-week series of interesting links, relevant to programming and programmers. You can check out previous Weekly Concerns posts in the archive. AOP with Matthew Groves blog post, from Pete's blog. Pete also did an Intro to AOP with PostSharp blog post. "Pete, Pete, Pete, enough about Pete already!" Okay, okay. I was reminded again recently how bad I am with regular expressions and how much I don't like them. Well, I came across a "fluent" interface for regular expressions called VerbalExpressions. I haven't used it yet, but it's something to keep an eye on. Week #2 is coming to an end here at CrossCuttingConcerns, which means it's time for another link dump post. LIDNUG (Linked-in .NET user group) recently posted video of Gael Fraiteur at their user group meeting. This was recorded in November 2010, so it's a bit behind the times as far as PostSharp goes, but it's still an informative video. Taking the Single Responsibility Principle (SRP) seriously. A deep dive into SRP, and just what is a "responsibility" anyway? Another white paper, but this one is about an interesting use case of AOP. It's based on a project to "trace" an application: not in the traditional developer sense of tracing through the code, but rather tracing a user's actions as she uses the interface to a system. And then using that information for later analysis (perhaps a usability study?). A blog post from Kristijan Rebernišak about using AOP to check user permissions: he uses Google Guice with AOPAlliance. 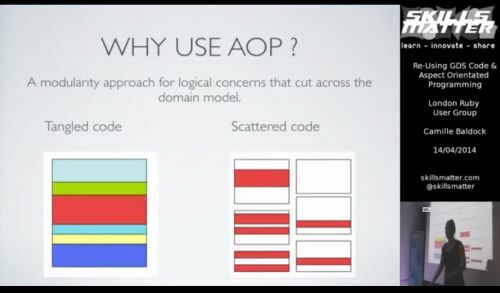 Chad England has started a blog post series on AOP with PostSharp. Thanks for reading, and please leave a comment or use the contact link above if there's something you'd like to see covered here on CrossCuttingConcerns.com (or if you have something to say and want it published here).